Right after we switched Troops, they had OA elections. 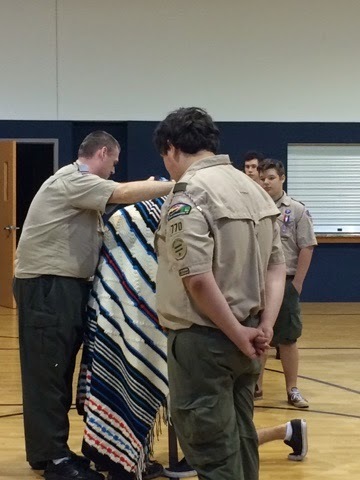 OA- Order of the Arrow - is Scouting's Honor Society. Not being with the troop for very long, Riley was unsure how that was going to go - since the boys didn't know him - or his scouting skills - very well. Tap Out was supposed to happen at Spring Camporee - that was going to take place while we were gone. We were told if he missed Camporee, he would get a letter. When our mail was finally delivered to us, I had forgotten about this. Both kiddos had a couple of things in the mail, a letter from one of our ScoutMasters was one of them! About the time he started opening it, I realized what it was. He started reading it aloud - Dear OA Candidate - and his eye... HUGE!! We read through all of the stuff and did what we needed to do to get him registered for Ordeal - the campout where they go through all of the secrety OA stuff (maybe I can share more aftr Ordeal - but for now, I know nothing about it!). Well, at the meeting tonight, they went ahead and did a TapOut for him. He is pretty excited about the upcoming campout for OA and being a part of it.